We can get caught up in being Human Doings and forget that we are Human Beings. 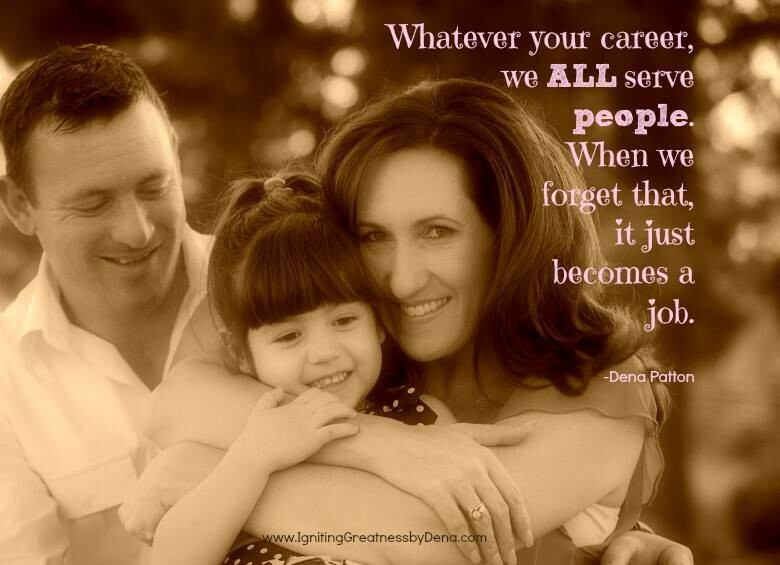 Part of creating a life of greatness is to remember that no matter what your job or roles are, you serve people. When we remember this simple concept our whole perspective changes, our whole relationship to our role changes and most importantly we remember that we are a human being serving another human being. By remembering that we serve people, in ALL that we do, it keeps us BEING instead of DOING, which is where smallness and mediocre tend to thrive. When you shift your life from a life filled with doing to a life filled with being you will feel the richness, connectedness, fulfillment and greatness that fills your life, your career and your heart…it’s the fastest way to feel ALIVE! Part of being a great leader who is building a great company is to stand in your greatness and serve others, this means your customers of course, but it also means your employees. Once our ego gets involved and tricks us into feeling that our employees ‘owe’ us or that they need to ‘serve’ us, then smallness has won. See, ego runs your smallness and it will trick you into lots of tricks that are not tied to greatness, not tied to serving others, and not tied to love, but the good news is you get to choose if you want to run your life from your greatness or from your smallnes from this day forward. Start today.